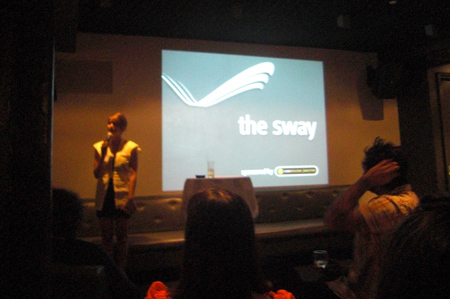 Tonight I went to The Sway “‘The Sway’ is a meet up for anyone interested in blogging as a business, making money in social media, and rising up as the creators of content to collaborate, not compete, in an online industry that just keeps growing…. The Sway is an informative and inspirational event, for networking, learning, and pitching in your thoughts on the big issues facing bloggers and publishers.” So Blogging for profit. It was the first time I had been to an event run by The Sway. It was a very good event and I would highly recommend it. Some great talks as well as lots of UK bloggers. The focus of the evening seemed to be how to make more money from blogging and blogging for profit. Lots of the people I meet said that it was not making them money but they were blogging as a passion as much as blogging for profit. However I was pleased to note that there were several people who were Blogging for profit and making a good income from it. Thanks to CJ and Skimlinks for making it happen. Skimlinks Unlock a new revenue stream for your website that is easy to implement and transparent to end-users. Skimlinks provides simplified affiliate marketing integration for blogging for profit.